This Jumbo Lump Crab Au Gratin recipe is incredible. Rich and a bit decadent…and all about the crab. 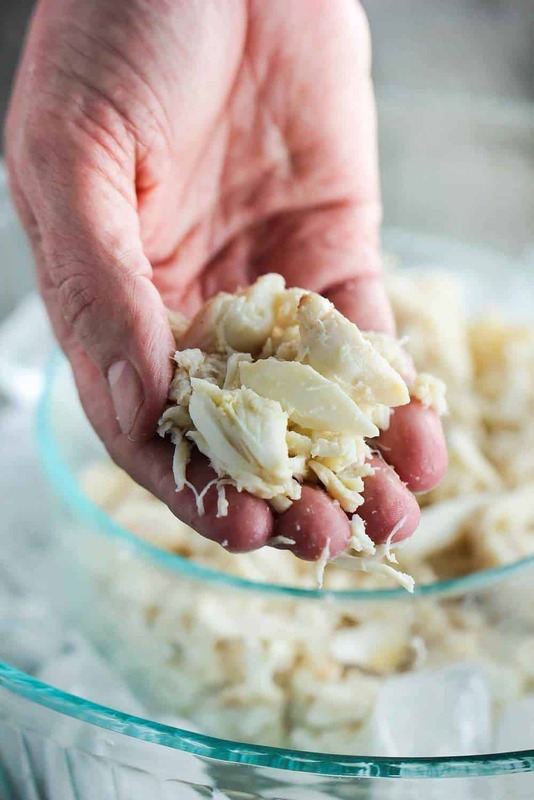 Pick yourself up some good quality lump crab meat (Gulf crab is amazing) at your local fish market and get ready to impress. Making this dish is easy and fun! 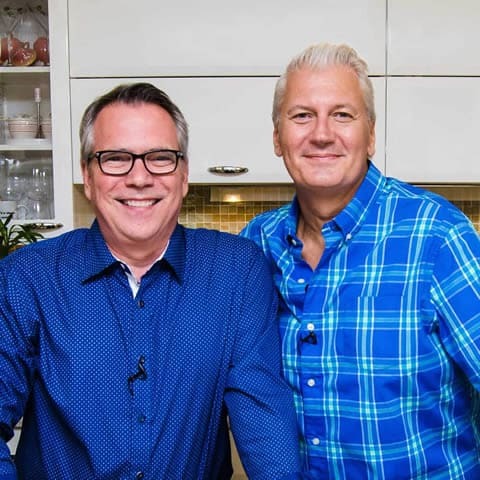 Watch us show you how to make one of the fanciest (but easiest) appetizers of all time! 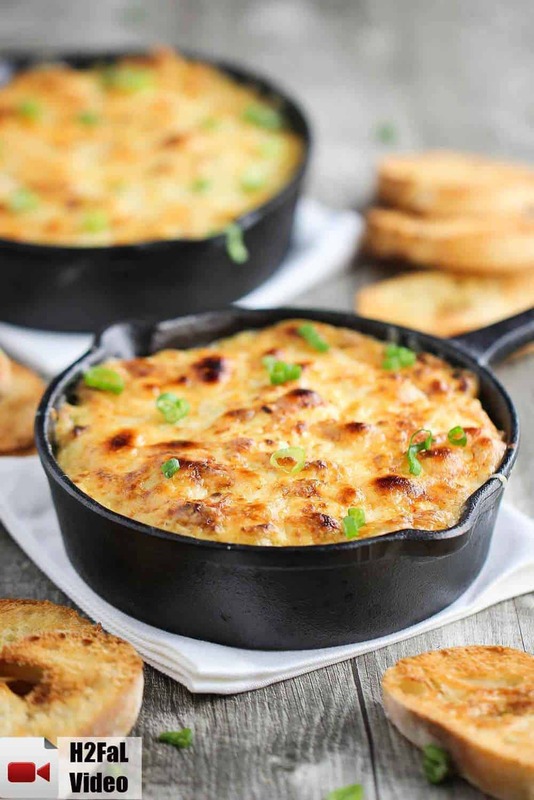 We love Jumbo Lump Crab Au Gratin! The ingredients in this amazing appetizer really help to elevate the star of the dish, which of course is the crab. Every time we serve this dish to guests, it gets nothing but rave reviews. It’s really, really good. 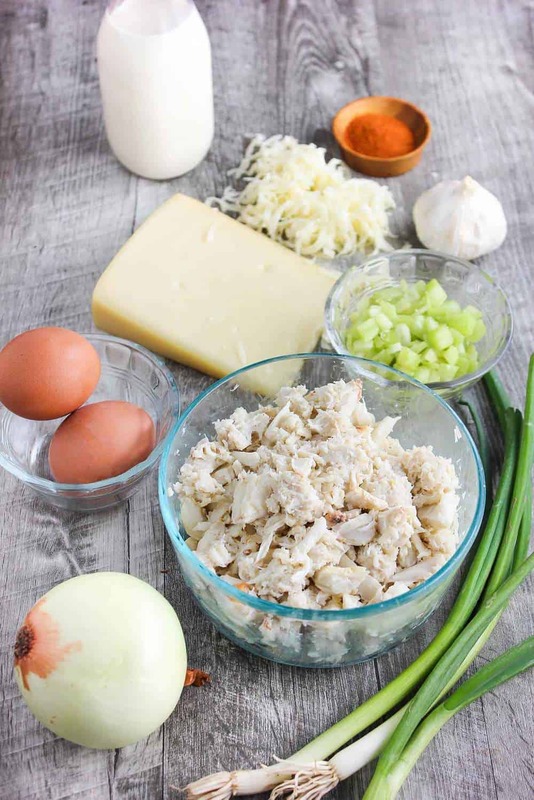 Lump crab meat is a bit pricey, so I usually go with a mix of lump crab and regular crab meat. But, always go with quality. Be sure to pick the crab over to remove any excess cartilage. I usually do this twice, just to make sure. This sauce is rich and creamy, and the perfect compliment to the fresh crab. Just place the crab in the bottom of the pan, and then pour that amazing sauce right on top. Top it off with a combination of your favorite types of creamy, melting cheese. Our favorite is a blend of Gruyere and Fontina. But, Monterey Jack, or Emmentaler, or even mozzarella will work. To learn all about the amazing History of Cheese, read this awesome article from the International Dairy Foods Association. And we love to serve these in individual cast iron skillets. But you can also use 1 large skillet when serving a group. It’s is beautiful in presentation, too! Make this dish and be prepared for lots of ‘oohs’ and ‘ahh’s’. It’s not for the faint of heart, and one serving is a wonderful appetizer, probably for 2 – 4 people. But, boy oh boy, is it good.. Crab lovers rejoice! What’s not to love with jumbo lump crab meat, Gruyere cheese and a little Cayenne for good measure? Another one of our most favorite crab dishes is our incredible Southern Crab Cakes. It’s one of our most popular dishes on the site! 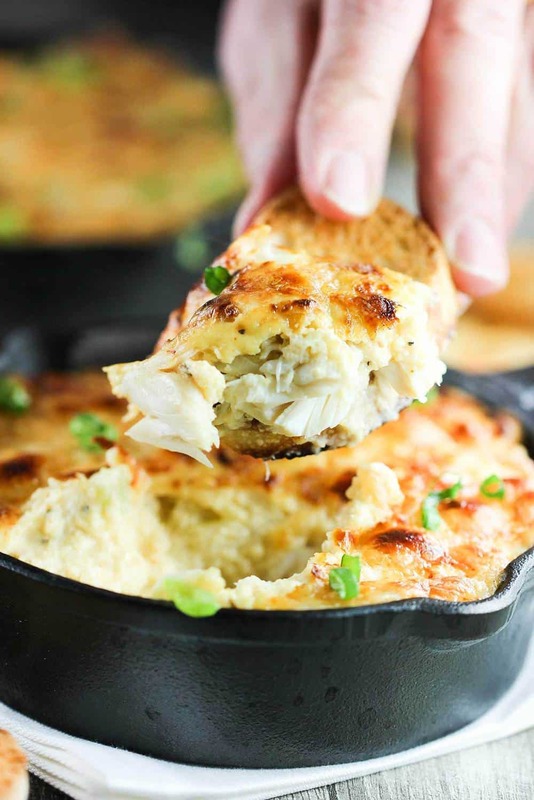 Now, it’s time to make this amazing Jumbo Lump Crab Au Gratin recipe! This jumbo lump crab au gratin is decadent and incredibly delicious. Serve as a wonderful first coarse. The crab, of course, is the star here, but complimented beautifully with the Gruyere and seasonings. Add the onion, celery, green onions (white parts), and garlic, and cook, stirring, until the vegetables are softened, about 5 minutes. Add the flour to the skillet, and blend well into the vegetables to create a white roux; be sure to not let the flour brown. About 2 minutes. Using a whisk, add the milk mixture, stirring constantly to blend into the roux mixture. Stir in the lemon juice, hot sauce, salt, cayenne, and black pepper, and continue to stir for another 4 - 5 minutes. (if sauce seems too thick, add a little water or milk to thin...should be the consistency of thick creamed soup). Remove from the heat, and fold in half the cheese; blend until it is totally melted and fully incorporated. Gently divide the crab meat among four mini oven-proof casseroles, or iron serving dishes; trying not to break up the crab lumps. Or, pour into 1 large cast iron skillet, or 8"x8" baking dish. Pour the cheese sauce over the crab, and then sprinkle with the remaining grated cheese on top. Bake until bubbly, about 15 minutes, then reset the oven for broil, and broil until the cheese begins to brown, about 5 minutes (keep an eye on this...don't let it burn!!). Remove from the oven, sprinkle with the green onions (green parts), and serve at once! I made liked you recipe a lot, but tweeked it a little bit. I had just one crab, not enough for the gratin. What I did was ad the souce with crab meat to some pre-cooked tagliatelle and shrimp and put it in the oven for 15 minutes and the broil for another 5 minutes. I served with some salad and it became an entree. I was thinking about putting it in some wonton wrappers, and baking them. 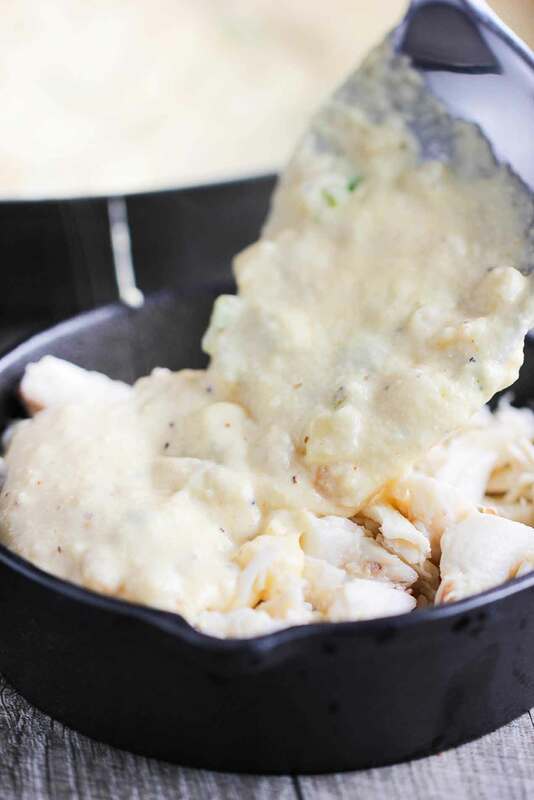 What side dishes do you suggest serving with the Crab Au Gratin? It sounds fabulous but looking for ideas, please! I made this last night and it was phenomenal. I made the recipe exactly as it was. It was by far the best recipe for crab gratin I have ever made. It was perfectly balanced. It was not really heavy like I have found some recipes for this to be. Just the right amount of cheese!. Absolutely delicious. CAN I GO THROUGH 1-8 ON A SATURDAY AND DO REMAINDER ON PARTY DAY, SUNDAY? It seems like you could do #1-8 and then bring it to almost room temperature before finishing…ya know? You guys are killing me! (Not to mention my diet.) We’re heading to the gulf in August. I’m going to bring this recipe and pick up some crab at Joe Patti’s in Pensacola. It will be perfect for a night of entertaining our local friends. Definatelly a comfort food. I love this on melba toast, and also excellent on thinly-sliced french bread (toasted). You gotta have fresh lump crab meat for this one. Don’t forget the Old Bay! Clarification on the flour. It says 2 tbs cup. It has to be tbs…right? I knew better…I make gumbo all the time and know the ratios. I’m making tomorrow for family who (for some incredibly insane reason) love imitation crab!!?? Ugh!! What that anyway??? I’m using some lightly smoked Gouda that I smoked this afternoon. I haven’t decided on the second cheese yet. Me again! I’m reading through the comments…. what are the correct measurements for the cheeses? The recipe reads: 1/4 cup each of Gruyere and Fontina. But then you said it should be 1 cup, 8 ounces of the cheese? Help! 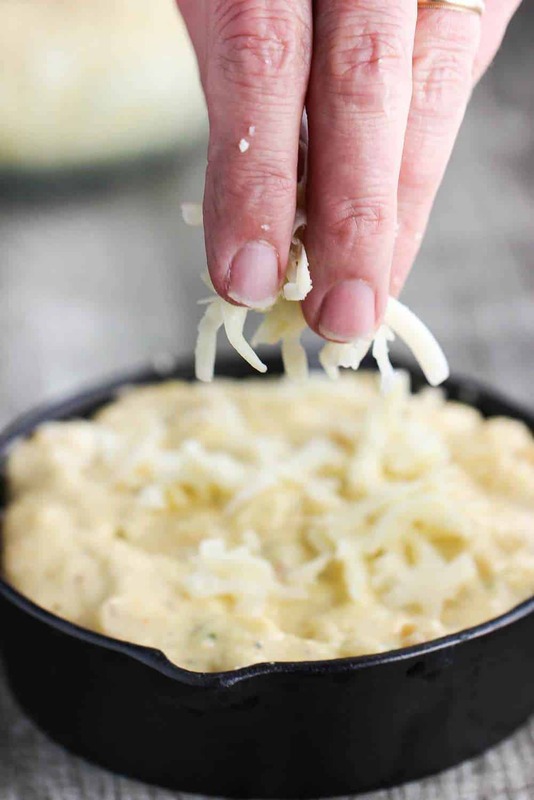 RE: Jumbo Lump Crab Au Gratin – what size mini cast iron skillets do you use? I only seem to be finding 3 1/2 ” mini cast iron skillets, that’s too small, right? Hi Ally-O!! We have numerous single-serve cast iron skillets that we love to use. We used our circular 5 1/2′-inch skillets for this particular recipe/photo shoot. The great thing about this recipe, though, is that you can really use any size. You can find larger (but still mini) on Amazon by click here: But, if you go with the smaller, which actually be would better for individual servings, you’ll still bake at the same time and temp, just keep an eye on them so they don’t get too brown on top. Really hope this helps, and let us know if you have any other questions or observations!! Divine and easy and you are right it’s all about the quality,thank you for ushering this recipe. Question: recipe calls for 2 cups (8 oz) of Gruyere cheese … but isn’t 2 cups actually 16 oz??? What am I missing? I know!! I so completely agree! If you love cheese, like we do, then I’d keep some extra on hand to sprinkle extra on top. I’d go with a cup in the mixture, and then sprinkle (probably another 1/4 cup, to 1/2 cup), over the tops. Sorry for the confusion!! 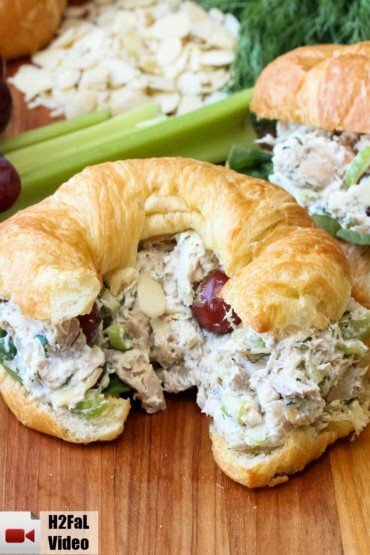 But if you like crab and cheese, you’re going to love this!! Let us know how it turns out and have a wonderful evening!! I wanted to make something special for our anniversary but we din’t have Gruyere or condensed milk so I was going to sear some scallops but Regina thought this sounded good (she loves crab) so she basically put it together and it did not disappoint! A mixture of cheddar and Monterrey jack and some half & half and we were there! Very tasty with a couple extra trays for tomorrow! Might be extra tasty with a splash of sherry but versatile no doubt! Thanks for sharing! I stubbled upon your website when I googled “crab meat au gratin”. I made this tonight and it was yummy. I live out in the country so gruyere was no available. I substituted and Italian blend and Havarti. I love gruyere but I think the subtle flavors of the cheese worked well. I also substituted no salt Tony Chachere’s for the cayenne pepper. Everyone in Louisiana is addicted to Tonys. Hi Martha! That sounds fantastic! This dish is pretty versatile. Thank you so much for letting us know!! Best, Kris & Wesley! Do you have to bake it in mini dishes? How can I adjust the baking time if I wanted to use one square pan? I made this for dinner tonight. We really enjoyed it. Its not hard to make and I will be making it again. That’s great to hear, Lee Ann! I’m so glad you like it and will be making again. Keep coming back for more! 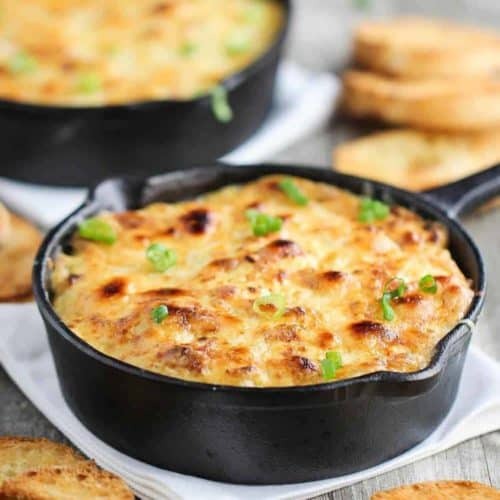 This crab gratin looks so incredibly delicious. All that melted Gruyere is seriously making my mouth water here! Hi Thalia! It is really good. I love Gruyere so much, too. It is decadent…but something special!